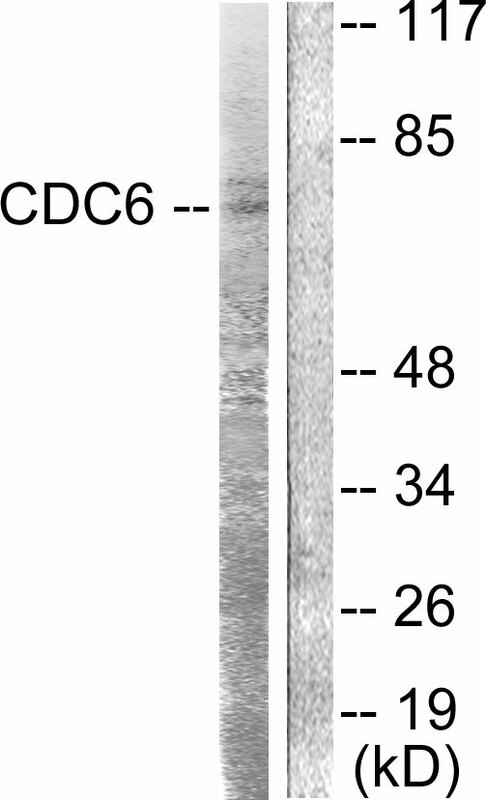 CDC6 (Ab-54) antibody detects endogenous levels of total CDC6 protein. The antiserum was produced against synthesized non-phosphopeptide derived from human CDC6 around the phosphorylation site of serine 54 (P-L-S-P-R). 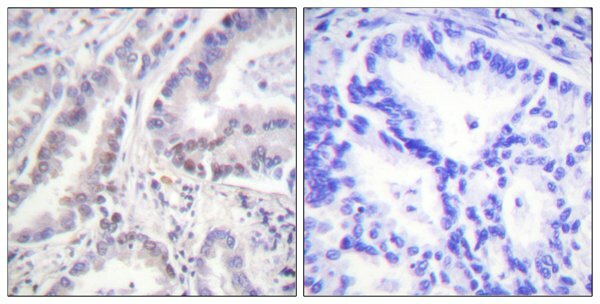 Immunohistochemistry analysis of paraffin-embedded human lung carcinoma tissue using CDC6 (Ab-54) antibody. Western blot analysis of extracts from HT-29 cells, using CDC6 (Ab-54) antibody. Jonathan R. Hall, Mol. Biol. Cell, Jun 2007; 10.1091. Luo Feng, Mol. Biol. Cell, May 2000; 11: 1673. Arturo Calzada, J. Biol. Chem., Mar 2000; 275: 9734. Rajesh Kasiviswanathan, Nucleic Acids Res., Sep 2005; 33: 4940-4950.